Modern-day interpretations of medieval markets typically offer an anachronistic hodgepodge of fact and fiction. 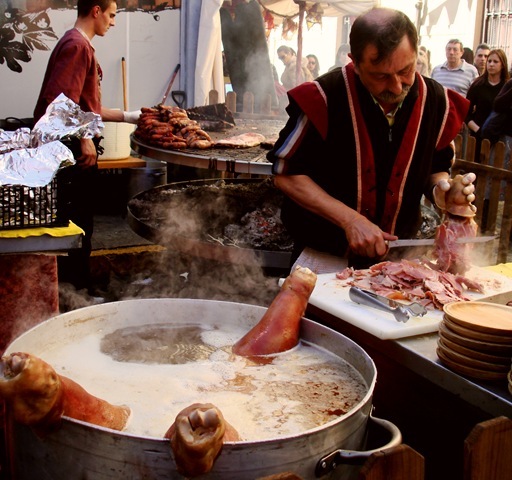 The annual Mercado Medieval in Orihuela (in the region of Valencia), billed as Spain’s largest, is no exception. In fact, anyone looking for pure historical authenticity here would be disappointed, but I, for one, actually like the mash-up. Orihuela’s medieval extravaganza, inaugurated in 1999, takes place every February, but I had yet to go. This year, the stars were aligned and the sun was shining, so Manolo and I hopped on a train in Murcia and headed 20 minutes north to partake in the themed festivities (wearing blue jeans, mind you). We were two of nearly 500,000 visitors reported to have attended the three-day event, thanks in part to busloads of British tourists lured inland from coastal resorts. Troubadours, princes and paupers from the past joined the 21st century crowd in the narrow streets of Orihuela’s historic center, where many buildings really date from the Middle Ages. The authentic backdrop includes a perched Arab fortress in ruins and several gothic churches, evidence of Orihuela’s transition from Arab stronghold to Catholic territory during the medieval period. 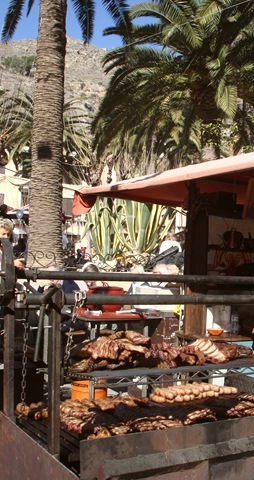 But I had not gone to Orihuela to lose myself in history and legends – I had gone to eat medieval market fare. Like other aspects of the event, the food was a blend of geographical influences and cultures, with a hint of medieval accuracy. Slabs of meat sizzled on grills the circumference of tractor wheels and whole pigs roasted on spits. Meals of potato omelets, cured meats and peppers were served on trenchers of bread. Many food vendors and their offerings hailed from the north of Spain, including Asturias, Galicia and Catalonia. Manolo and I tried a butifarra, a Catalan sausage, cooked with rich caramelized onions. We then shared a forearm-length sandwich packed with juicy ham that had been roasted whole in a wood-burning oven. We washed it all down with cans of macro-brewed beer. For dessert, we took the greasy and fried route, opting for squash buñuelos (fritters) sprinkled with sugar. 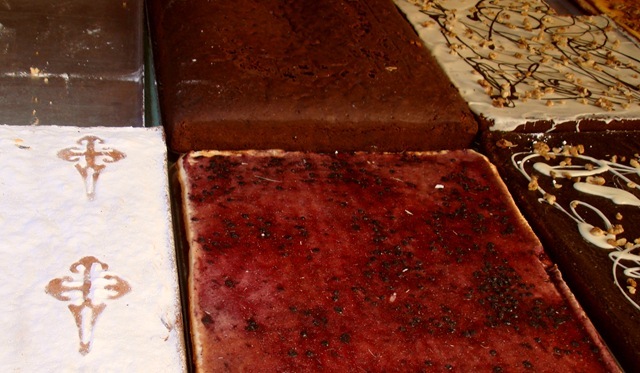 Other stalls sold candies flavored with natural aromas, such as rosemary and anise, and cakes and tarts from various Spanish regions, like thecross-stenciled Tarta de Santiago from Galicia, a long-time pilgrimage favorite. 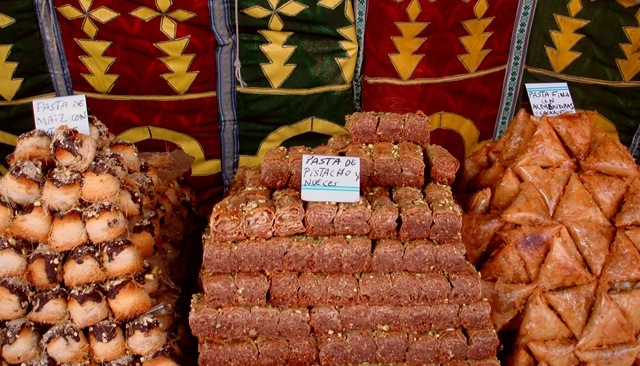 The Arab presence in medieval Spain was also strong at the Mercado, particularly in terms of food, with turbaned vendors selling couscous, kebabs, honey-drenched pastries and sweet mint tea. After lunch, Manolo and I checked out some of the crafts, which were even more historically disparate than the foods. 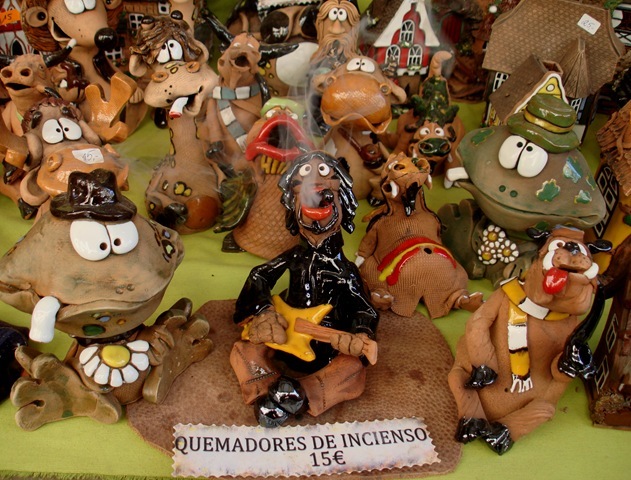 A definite hippie vibe emanated from the “artisan goods” and their itinerant makers, many of whom were Argentinean. This was a new generation of travelling sales folk, following the medieval market circuit. As we strolled through the market, Manolo and I caught some entertainment from wandering troupes of musicians and belly dancers. In a section dedicated to knightly pursuits, we saw young men dressed as pages preparing for a tournament and children shooting arrows with suction cup tips at their parents and siblings. We fortunately emerged unscathed. By late afternoon, the busiest stalls were those selling mojitos to a young, festive crowd, mostly dressed in modern-day attire. In today’s medieval Orihuela, you can choose your own adventure. As for Manolo and me, we skipped the mojitos and decided not to stay on for the evening spectacle, an allegorical battle between good and evil involving princesses and Lucifer and his dragons. I was satisfied with our edible journey through time, where everyone, heroes and villains alike, had a place at the table.